Home › Life › Airing of Grievances › Is a Hot Dog a Sandwich? Never one to shy away from controversy, I have decided to tackle this topic today. I have long put it off, but it is a topic I can ignore no longer. First things first, it is important that we determine the parameters of a sandwich. That is, what it means to be a sandwich. If you can’t properly define what a sandwich is, then your opinion in this matter bears very little weight. A quick Google search (AKA: “Research”) tells us that a sandwich is an item of food consisting of two pieces of bread with meat, cheese, or other filling between them, eaten as a light meal. If you ask my lovely bride, a hot dog is not a food item. 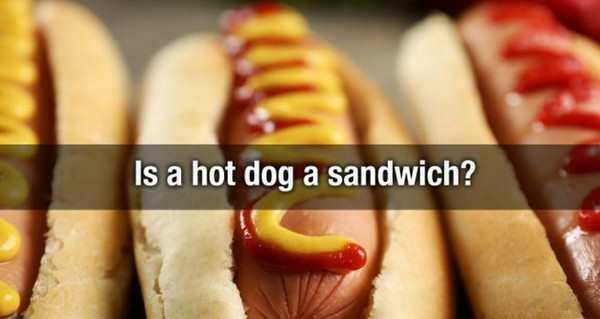 If you ask anyone who has ever eaten a hot dog, the bun is expected to be cut down the middle, but not separated into two distinct pieces of bread. A hot dog is a sausage that is frequently served in a split single bun, and it shares that category with bratwurst, polish sausage and other sausages of European origin, with a strong emphasis on Germany. The frankfurter and kielbasa are also within this category. Please note that the category is the sausage, specifically the linked sausage. The bun is an optional modifier. The category that houses the hot dog is German while the proper sandwich is of British origin. Then comes the debate over whether it is acceptable to use ketchup on a hot dog. If the hot dog is intended to be served to children, I say that it is acceptable. But don’t you dare put ketchup on a Chicago style or on a Chili dog. Those versions are not for children but for men.